Spring Gate Vineyard is tucked away in a largely residential area in Harrisburg and offers guests a serene place to bring family and friends for a taste for Central Pennsylvania. Rebecca Kline, Wine Queen and Director Of Operations, shares the story of Spring Gate and why so many locals love the wine, beer, and farm-like atmosphere. Watch the video below! Spring Gate planted their first vines in 2010 with five employees who pruned, harvested, crushed, and (painstakingly, lol) taste tested to perfect their first batch of wines. On opening weekend, Spring Gate shared their wine with just 50 visitors who sat around three tables. 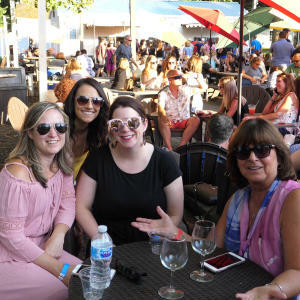 Now, on a beautiful festival weekend, Spring Gate will entertain 2,000 to 3,000 guests who sit all around their property, sampling dozens and dozens of the vineyard and brewery beverage options. 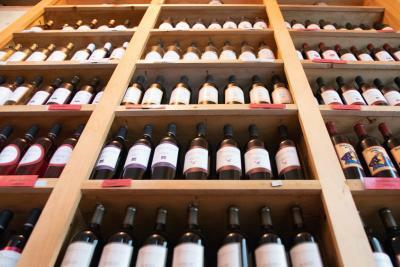 Spring Gate has more than 50 varieties of wine, with new barrels releasing every month. They’ve got whites and reds for every palate plus fruity ciders, mimosas in a bottle, and one of the largest selections of sparkling wines in Pennsylvania for those looking for a little bubbly. Spring Gate is also known for their wine slushies! Not just a summer treat, Spring Gate has up to four flavors available all year round, and people will drink them! Blended with their wines, you’ll find seasonal flavors like Peach and Strawberry in the summer and Pumpkin Spice in the fall! A 2015 addition to their vineyard is their brewery, with more than a dozen frothy beers made with spring water from the property. Their flagship brew, Belgian Blonde Ale, is golden in color, with a fruity/spicy yeast profile and slightly sweet malt flavor that finishes dry. Dark beer fans can savor the Samoyed Russian Imperial Stout with hints of coffee and salted caramel and a whole lotta chocolate! If you’re looking for a quick munchie in the brewery, you gotta try the bacon on a stick. There’s something for wine and beer lovers, but Spring Gate hasn’t forgotten cocktail connoisseurs! Spring Gate’s brewmaster is also a mixologist, shaking up unique drinks made exclusively with Pennsylvania products. Saturdays are for festivals, Sundays for seafood. Wednesdays and Thursdays have wine slushie happy hours and Fridays are cider nights. So what we’re saying is: there’s always something going on at Spring Gate! Many of their themed festival weekends tie into seasonal produce like the Peach Festival, or what’s on the calendar, like the Summer Solstice. You might even be asked to wear a crown or a costume, which many visitors happily oblige! As a visitor of our region, we bet you’re interested in getting an immersive, local experience. 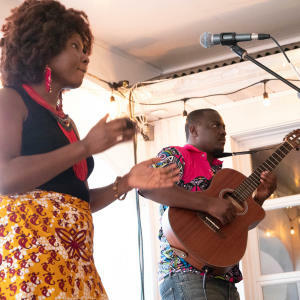 Getting a taste of what Spring Gate has to offer extends beyond their drink menu to showcase Pennsylvania’s culture and personality, from local live musicians and bands to some of Central PA’s most mouthwatering food trucks. Giving out free smells, the BBQ truck smokes their meats for their sandwiches right on the property. Pass the dessert wine for pairing with locally made cheesecake, whoopie pies, and ice cream. Stop by Spring Gate’s snack shack that offers artisanal baked goods and products from local vendors that make perfect take-home treats. 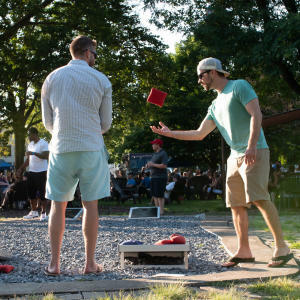 Spring Gate is a dynamic place with several indoor/outdoor seating areas, eclectic bands and musicians, rotating food trucks, and of course, seasonally changing wines, beers, ciders, cocktails, champagne, and slushies!